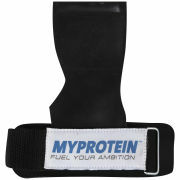 The Myprotein Lifting Grips are ideal for anyone that is involved in heavy weight lifting. These improved lifting straps come in one size and are ideal for extremely heavy lifting specifically on exercises such as dead lifts and bent over rows. These will assist you when lifting extremely heavy weights by providing a secure grip and support. The straps also help to increase the contact with the bar and are padded to provide extra comfort when lifting.